All of our caregivers are fully screened, trained, bonded and insured. 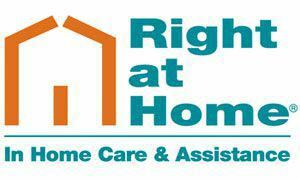 They undergo competency testing, state backgound checks, and are professionally trained through our exclusive Right at Home CERT (Caregiver Education Recognition & Training) Program. Our rigorous orientation, training, and continuing education programs insure they clearly understand how to manage clients’ needs in a respectful and compassionate manner. WHY RIGHT AT HOME ??? Their journey to at home care comes from a very personal experience. Kathryn’s mother was diagnosed with Alzheimer’s in 1998 at the early age of 50 and lived 10 years until her passing in 2009. Although they had a very strong support system locally with sister, Aunt, and other relatives to help, they still found themselves in need for additional care. In order to keep their mother at home they turned to a local agency for support. They believed that this type of care provided the respite each family member needed while maintaining the care and dignity of their mother. They also felt compelled to find a home care agency they could partner with that would enhance the quality of life for the one they would care for and the family members around them. Right at Home earned their trust and each caregiver must earn the same. “A caregiver that we hire, would be one that we would have for our mother” .